Every Great Landscape Starts with a Great Design! 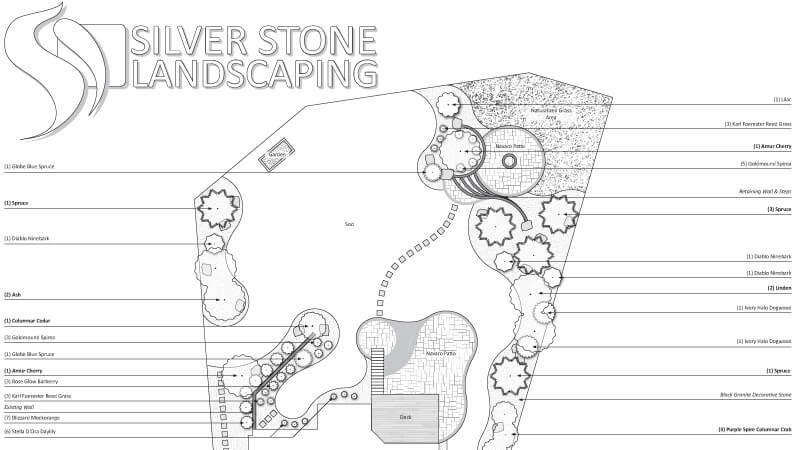 Whether your project is big or small, it’s fundamental to start with a landscape design. It provides the customer with the ability to visualize their yard and understand the scope of the project. It also gives the ability to make changes before the project starts. The ability to make changes helps minimize error during the construction process, which helps the customer stay within their determined budget. From a business stand point, a design is crucial. Firstly, it allows the landscaping company to convey their customer’s needs, wants and vision into a organized plan. From there the customer can decide if the plan presented to them is or is not on the right track. This enables the landscaping company to make revisions before work has already started. It may seem insignificant, but making changes prior to construction is one of the most effect ways to save money. Once the design is finalized it allows the landscaping company to accurately estimate on the job. A design is a win-win, it helps the customer know what they are getting while helping the landscaping company understand what vision they are providing. When it comes to landscape designs there are two options to choose from, 2D and 3D. Both options are important, and serve specific purposes. What is 2D Landscape Design? 2D design is an aerial view of the project. It is a scaled perspective showing various elements and features positioned in the yard. With a 2D design, customers gain a better understand of how their yard space is being utilized. They are able to increase and/or decrease features by adding or subtracting if need be. Generally, a 2D design is used by landscaping companies for estimating and measuring purposes. It illustrates lengths, areas, and items to quote on. A 2D design is also referenced to accurately lay out the landscape prior to construction. Since a 2D design plan is to scale, the landscaping company can quickly and easily translate the plan into actual life-size measurements to begin construction. 3D design takes design to a whole new level. It gives the customer the ultimate perspective of their landscape before its even started. 3D allows the customer to see what their yard will look like from various angles and standpoints. This includes, but is not limited to, things such as decks, balconies, pools, etc. 3D design is a great way to illustrate various elevations and grade changes. And, as a result, can help determine the placement of retaining walls, steps, and pathways. 3D landscape design is a very useful tool for helping customers choose between different products and colours. Also, it helps the designer convey their ideas clearly. Essentially, 3D design eliminates any second guessing the customer may have and subsequently helps the project run smoothly. A project that runs smoothly drastically reduces the need for revisions during the construction process which can save the customer money in the long run. When choosing between a 2D verses a 3D design there are certain factors the customer needs to consider. The first and most important factor is the scope of the work that needs to be done. Often, a small and relatively straight forward landscape job does not need an elaborate 3D design. With smaller jobs, most landscape contractors can explain the plan without much confusion. Small jobs usually include a patio, a planting bed and/or a face-lift. 3D designs are extremely useful for large and detailed landscape jobs. While customers may feel that a 3D design is not worth the extra cost, the extra cost is relatively small when one can be at ease knowing exactly what the final product will look like. The second factor is the customer’s ability to visualize. Each person’s ability to visualize something is different. Some people are easily able to look at a 2D design and visualize exactly what it will look like in real life. Customers such as these may find 3D designs redundant and unnecessary. Customers with a strong visualization ability tend to have an inherent trust in their landscape contractor which allows for creative freedom when doing a job. Meaning that during the building process, customers feel comfortable allowing their landscape contractor to take creative liberties that may revert from the initial design. In this instance, a 2D design is more suitable as it is able to provide a design guideline, as well as a detailed cost estimate. Exact shapes, configurations and positions may change as the project evolves without resulting in additional customer costs as the estimate accounted for the proper quantity of materials. The final factor when choosing between a 2D verses 3D design is the upfront cost. 2D designs are much simpler, and quicker for the landscape contractor to do. 2D designs requires less labour on the part of the landscape contractor, and can often be done based off a site plan gathered at the initial meeting. On the other hand, 3D designs are more labour intensive than one might realize. 3D design encompasses everything found in a 2D design with the added benefit of a 3D rendering. A 3D rendering involves a few site visits to accurately determine various elevations and obtain all the necessary measurements. Photos are taken of all surroundings, including the property and house to make sure things are inputted into the design correctly. Simply inputting the house and elevation information into the 3D program takes a considerable amount of time and effort. Typically, 3D designs cost significantly more than a 2D design and for good reason. With a 3D design the customer is provided with all the aspects of a 2D design. And the ability to walk through their yard before it has even begun. Every great landscape always starts with a design. Whichever landscape design option you choose, what’s most important is that there is a fully developed plan. This design is the blueprint for your future yard. It gives the customer something to consult, and the landscape contractor something to follow. The design is the single most important tool in any great landscape project. It helps the project progress smoothly, and saves time and money. Ultimately, it leads to a final product that exceeds expectations without any unwanted surprises!